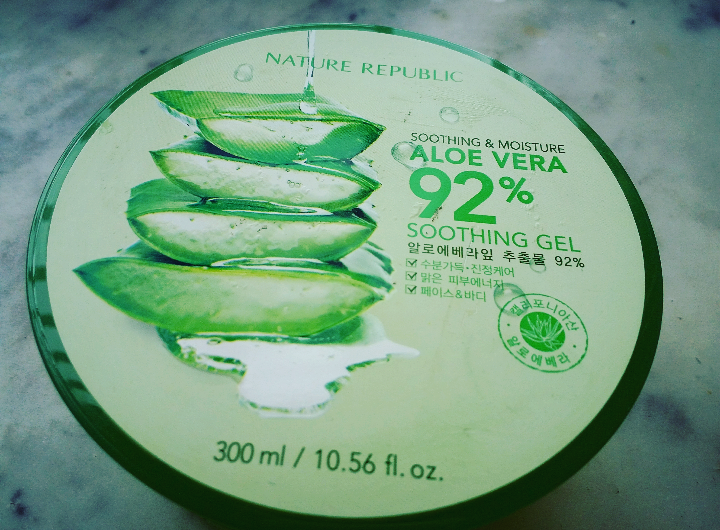 PRODUCT REVIEW #1- NATURE REPUBLIC ALOE VERA SOOTHING GEL. A breakthrough product in the history of modern cosmetology is Nature Republic’s Soothing and Moisture Aloe Vera 92% Soothing gel. What they claim– Enriched with natural Aloe vera, this gel can be used to mildly moisturize various parts of the body such as legs, face, arms and hair. Price– I bought it from Amazon India. It costed me 1550 INR for 300ml. Texture– Very light watery gel. Forms a very thin smooth layer on the skin. 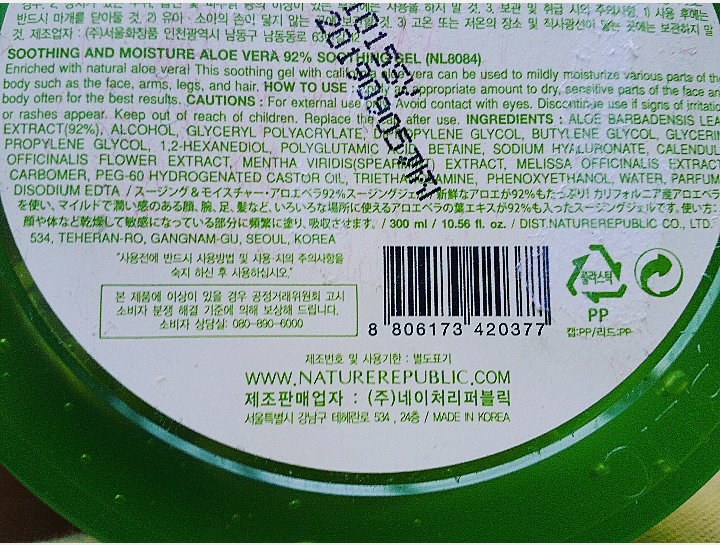 Ingredients – This being one of the best Korean products, I decided to do a lot of research on the internet about the various benefits of its ingredients. And I was so satisfied after the research. The product has whatever it takes to be one of the very best ! 1. 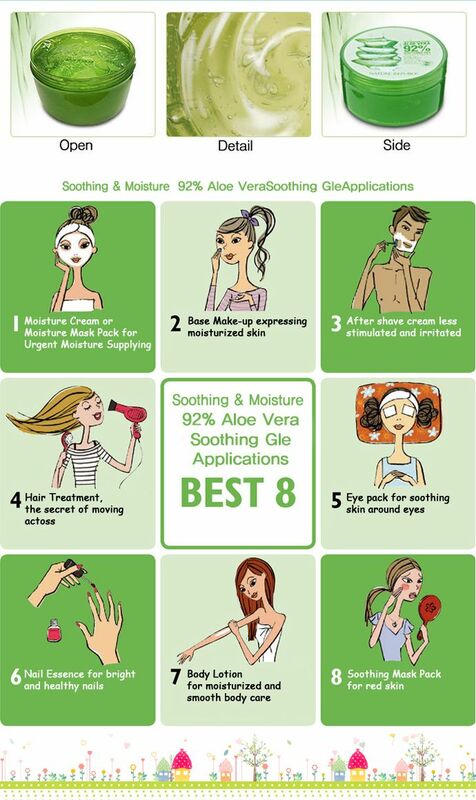 Aloe Barbadensis Leaf Extract 92%– Known for its innumerable health benefits, Aloe Vera tops every list in being the most effective and powerful skin moisturizer. It has cooling effects. Helps HEAL sunburns. Aloin, present in aloevera blocks about 30% of the UV rays. Works miracles by reducing the redness and inflammation of acne. Has Anti-ageing properties. Rich in Vitamin E, helps in skin renewal- giving a moist, soft and healthy skin. 2. Glycerine – Used as a cleanser, toner and moisturizer as a solo product. Helps in acne and blackheads. A skin lightening agent and sunscreen- gives soft, supple, scar free skin. 3. Propylene glycol , Butylene glycol, Di-propylene glycol- To decrease viscosity and act as a solvent. 4. Polyglutamic Acid – used as a skin conditioner, locks moisture to give a subtle look. It is 10 times more hydrating than hyaluronic acid. 5. Sodium Hyaluronate– Holds water and aids in skin volume. Along with UV protection, it also reverses free radical damage- giving a softer, smoother and fuller skin. 6. Calendula Officinalis flower– – Pot Marigold, loaded with antiseptic and anti inflammatory properties. Helps in sunburn, rash, contact dermatitis, premature ageing, thinking of skin, under eye-Crow’s feet.etc. Rich in Carotenoids, Vitamin A, helps unleash a supple skin. 7. Melissa Officinalis extract – lemon balm, a member of the mint family. Contains Caffeic and Ferulic acid- both of which are potent antioxidants. Helps in calming, soothing, healing and tightening the skin. Works well on acne and sunburned skin. 8. Mentha Viridis ( spearmint extract)- Known for its toning, refreshing and anti septic properties. 9. Other ingredients– Alcohol, glycerol polyacrylate, 1,2-Hexadi-ol, Betaine, carbonara, PEG-60-Hydrogenated castor oil, triethamine, phenoxyethanol. 1. Take a small amount. Apply it as a make-up base. 2. Can be used before stepping into the sun. 3. I apply as a mask- a thick coat. Keep it for an hour. Wash it off. 4. Take moderate amount. Mix it with a little rose water. Massage in circular motions. Keep it overnight. 5. I haven’t used it for the hairs yet. 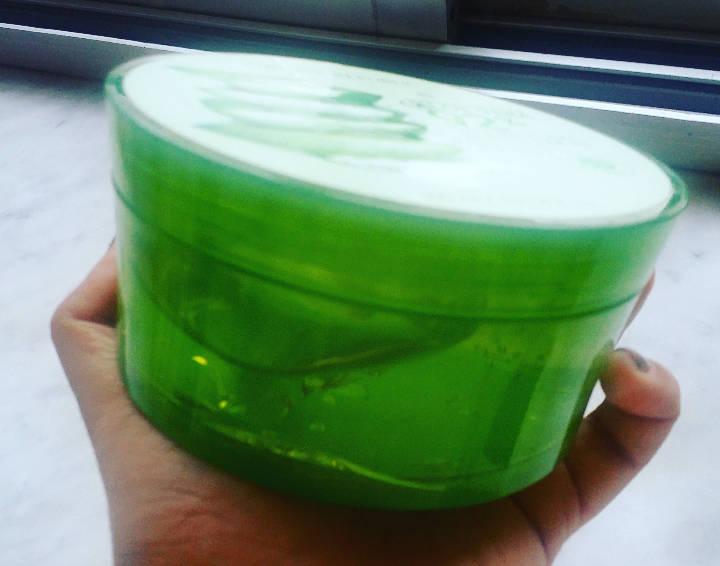 But I will surely try it out and maybe review it in a hair mask blog soon. How I found the product ? It comes in a 300 ml tub. The packaging is very green and bright and it gives herbal vibes. It is travel friendly, but only if you are carrying a medium sized cosmetic pouch. Lasts very long. I have been using it for almost a month now, and I haven’t even finished one fourth of it ! The smell is mild and pleasant to the senses. You can get a very mild mint small, most probably because of the spearmint ingredient in it. The gel was very thin, transparent and light weighted, perhaps the most lighted product I have ever used ! It is very watery because of the glycol solvents in it. It is very soft and plumpy to apply and I feel like massaging it endlessly ! After immediate application, it gives skin a very healthy and supple glow. When I use it at night, it gives a glowing and bright moisturized skin in the morning. As a makeup base, it acts like a primer and the makeup stays for long. With regular use, lightens the scar. If you have an oily skin like me, the gel coverage Doesn’t last for more than 2 hours. I haven’t seen any noticeable action on the acne. I noticed little whiteheads on the nose and chin after using this. The sunscreen property is debatable. Didn’t help me with my dark circles. – .75 for the price, whiteheads and also, it’s not avaiable in smaller sizes, that makes it less travel friendly. I shall be reviewing other products from Nature Republic very soon. I am in total love with this brand ! You can drop your suggestions and what you would like me to review, in the comment section below. Previous Takes strength to be a person of substance. Next What do you see? Thank you for stopping by Dear. How is your week going ?? How have you been doing ??? Oh, gotta fix it. Thanks for stopping by and you kind words ❤ Happy wednesday! 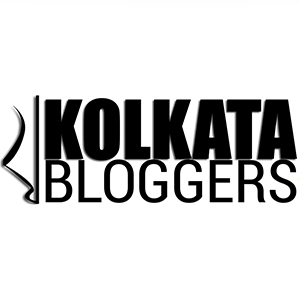 A very motivational blog for people like me who takes no care of themselves 😂. But definitely would try to give this product a chance 😘after reading this . You are yourself so beautiful and your skin is so flawless, you don’t need to take care of yourself !!!! It looks like a great product. Thanks for sharing. Great post! I have used aloe vera for sun burns. It really helps. Thanks for letting us know of this. You sold me on it. Want some. Waaaow. Isn’t it so amazing ? It is one of my personal favourites!!! This product is quite good. If you have an aloe Vera plant in your house, that’s super amazing then. And if you don’t, use any aloevera gel. 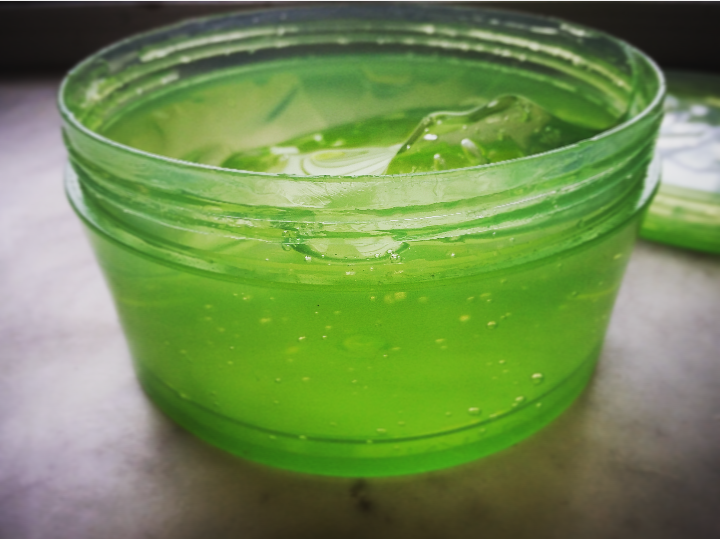 What you can do is mix aloe Vera gel with a little rose water and massage. Rose water helps in penetrating penetrating the gel into the skin. This mixture has helped a lot with my acne and also helped in firming my skin.